Dipl-Ing. Dr.-Ing. E.h. mult. Ludwig Boelkow, the pioneer of implementing Renewable Energies and Hydrogen Energy into a Hydrogen Economy, has passed away on July 25, 2003 at his home in Gruenwald, near Munich, Germany at the age of 91 years. Ludwig Boelkow was born 1912 in Schwerin, Germany. He was the founder of the German Aircraft and Space Industrie. (MBB - Messer-schmitt-Boelkow-Blohm GmbH, now part of DaimlerChrysler AG - Arno A. Evers was employed in this company 1969-1991) At the peak MBB employed 70,000 at 20 plants in Germany. 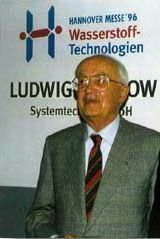 In 1983, Ludwig Boelkow started his own foundation: The Ludwig-Boelkow-Stiftung (now known as L-B-Systemtechnik GmbH). His foundation exhibited at the Group Exhibit Hydrogen + Fuel Cells at HANNOVER FAIR every year since 1995. His spirit will live on through his many initiatives and achievements to society and the emerging Hydrogen + Fuel Cell Industry. Arno A. Evers FAIR-PR and his team pays tribute to Ludwig Boelkow and is committed to carry on his visions in his remembrance. So that the possible happens, the impossible must be tried over and over again.